George Stephanopoulos: You were in that room on Thursday for all three hours. You questioned James Comey. Was he a credible witness? 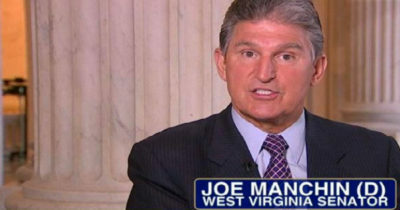 Joe Manchin: Yes, sir. Yes, sir. He did a good job and I think everyone there, Democrats and Republicans alike, thought he did a good job. And he was forthcoming. He offered to come to the committee not only in an open session, he came to a closed session also, George, and that was pretty special because when you heard him say I’m sorry I can’t answer that and speak about that in this setting, that was of a higher classified and we went into a classified hearing afterwards, he answered everybody’s questions. So we were very appreciative of that. George Stephanopoulos: Do you agree with this conclusion that the president has reached that there was no evidence of collusion? Joe Manchin: You know, we haven’t seen any of that whatsoever, George. We’ve been looking and showing everything they possibly have. That has not led to that. We have ultimate — all of us have the utmost respect for Bob Mueller, both on the Democrat and Republican side. I believe he’s going to do his job thoroughly. We will accept his recommendation and pathway forward and I think that’s extremely important that we all agree this is the right person, the right time to do this type of work. Did you get that? No evidence “whatsoever,” they’ve seen “everything they possibly have,” and they’ve seen no evidence to support the idea that President Trump might have colluded with the Russians. That should be the end of this conversation, but still today, many other liberals continue to argue that Trump has done something wrong. They don’t know what… but something. Comey a "Spineless Weasel" who Knows how to "Use" the PressObstruction of Justice?